These can be used for waste, commingled recycling, document destruction, medical waste and other specialised requirements. Gaining popularity these days are our 660 and 1100 litre bins. These are lighter and more maneuverable than our larger metal bins and again available for most applications such as waste, combined recycling and paper and cardboard. The mainstay for our commercial customers are our 1.5 and 3.0 cubic metre bins. These galvanised metal bins come with a variety of options such as wheels and locking devices. Very popular for waste and paper/cardboard, these also have the capacity to take larger items. 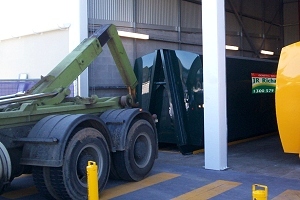 These bins can also be supplied in 4.5m3 capacity which are suited to high volume low weight waste or recycling. 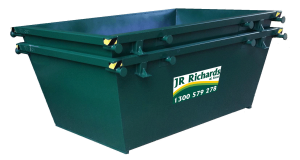 Our skip bins for builders and household clean ups come in a variety of sizes ranging from 1.5 through to 8 cubic metres. The most popular of these for builders are the 4m3 bins which have good capacity and are still easy to load. For those larger tasks we have our hook lift bins which range in size from 8m3 through to 30m3. These are also popular on larger construction sites and where demolition and removal of items is required. And for those generating lots of waste or recycling such as shopping centres and hospitals, we have on-site compactors with bins which are fully enclosed. These units provide a good cost effective solution by maximising the storage capacity and minimise servicing requirements. There are many different types of compactors available, from small units capable of producing bales of cardboard through to the larger waste types and refrigerated sealed units for preserving putrescible food wastes to reduce odour and vermin. 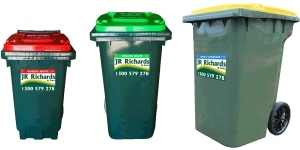 Here at JR Richards & Sons we pride ourselves on our ability to provide solutions to your waste and recycling needs. Custom made bins of all shapes and sizes can be supplied to cater for specific commercial requirements so please don’t hesitate to call our staff and discuss your needs.